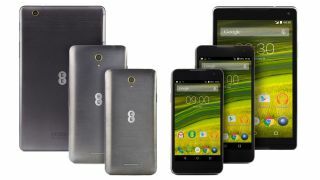 Hot on the heels of its duo of low-cost, 4G Harrier smartphones, EE has launched a complementing tablet to prop up its affordable onslaught on the mobile devices industry. The EE Harrier Tab sports an 8-inch full HD display, 1.5GHz octa-core processor, 2GB of RAM, 16GB of storage, microSD slot and a 4650mAh battery. Oh, and it obviously has superfast 4G capabilities too. It's taking over from the Huawei-made EE Eagle which launched last year, inheriting its £199.99 PAY G price tag, while pay monthly deals start at £18 per month for 10GB of data if you want the Harrier Tab for free. You'll find Android 5.1 Lollipop on board, while for camera fans a 2MP front snapper is joined by an 8MP rear facing option. All this means it stacks up surprisingly well against the iPad mini 3 (starting at £319) which boasts a 7.9-inch 1536 x 2048 display, 1.3GHz dual-core processor and 1GB of RAM, although it does sport larger internal storage options and a sizable 6470mAH battery. If you're tempted by the EE Harrier Tab it's on sale now in store and online.